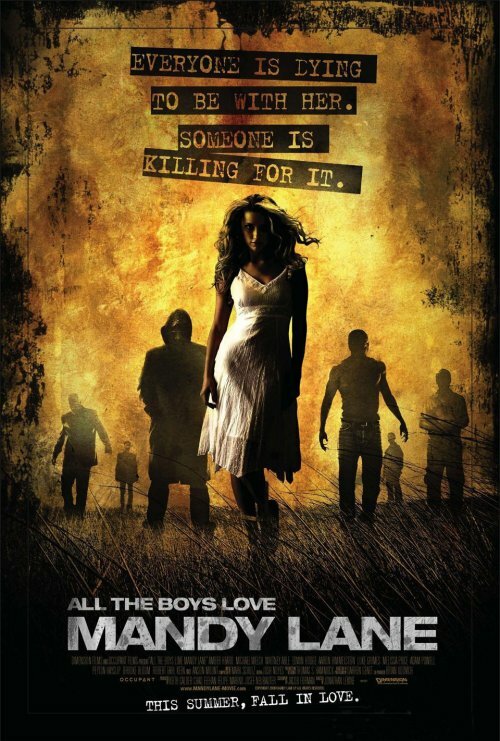 This poster for the small horror flick All the Boys Love Mandy Lane certainly is striking. The fiery background and the characters, which are mostly covered in shadows, do call attention to themselves and make for an interesting image. But I don’t really like the poster, mostly because it doesn’t look like a poster for a horror movie. Certainly not a horror movie where these characters are brutally murdered one by one. To me it mostly resembles the cover of a somewhat dark comic book, starring a fierce and courageous heroine who wears a white dress. And I don’t have a problem with that, but it doesn’t seem like an accurate description of the movie. From what I’ve read, All the Boys Love Mandy Lane deals with many of the typical problems and anxieties that plague teenagers, but ups the ante by adding a serial killer, which definitely increases the fear factor. I see none of that in the poster. No fear, no anxiety, no “monster” lurking in the shadows. Nothing. I haven’t actually seen the film, so perhaps I’m wrong about its substance. But this looks to me like a possibly good poster, but not for this movie.